"The Tribute that Vice Pays to Virtue"
What if Most Americans Don't Care That Deeply about Trade? "In fact, recent public opinion polling uniformly reveals that, first, foreign trade and globalization are generally popular, and in fact more popular today than at any point in recent history; second, a substantial portion of the American electorate has no strong views on U.S. trade policy or trade agreements; third, and likely due to the previous point, polls on trade fluctuate based on partisanship or the state of the U.S. economy; and, fourth, Americans' views on specific trade policies often shift depending on question wording, especially when the actual costs of protectionism are mentioned. These polling realities puncture the current conventional wisdom on trade and public opinion—in particular, that Americans have turned en masse against trade and globalization ..."
Thus argues Scott Lincicome in "`The "Protectionist Moment' That Wasn't: American Views on Trade and Globalization," written as an installment of the Free Trade Bulletinfrom the Cato Institute (November 2, 2018). Pew (May 2018) found that American support for free trade agreements rebounded to pre-2016 levels, only a couple percentage points off its all-time high in 2014. WSJ/NBC News (March 2018) found "Americans overwhelmingly think trade is more of an opportunity to boost the economy than it is a threat to it . . . by a 66%–20% margin. And that feeling transcends party lines, as Republicans, independents and Democrats agree that foreign trade is an opportunity for economic growth." Gallup (March 2018) found that "[a] strong majority of U.S. adults (70%) see foreign trade as an opportunity for U.S. economic growth through increased exports rather than a threat to the economy from foreign imports (25%)"—down from an all-time high in 2017 of 72 percent. Before that, "no more than 58% had held the positive view of trade." Monmouth (June 2018) found that 52 percent and 14 percent, respectively, of Americans in 2018 think that "free trade agreements are good or bad for the United States" up dramatically from 24 percent good and 26 percent bad in November 2015. 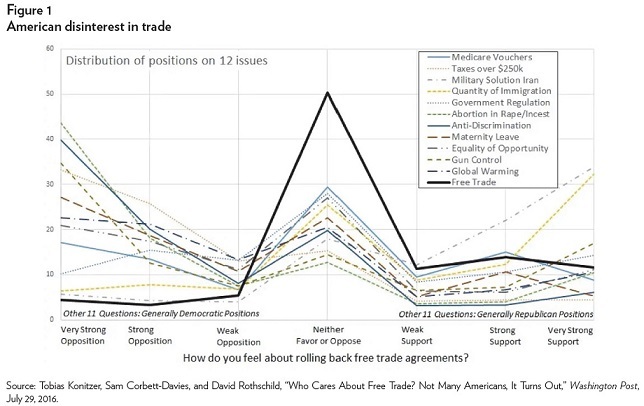 But perhaps the deeper lesson of the polling data seems to be that American opinions about free trade do not seem especially strong or robust. For example, my own guess is that some of the rise in support for trade is a reaction against President Trump's anti-trade rhetoric and policies--but that some of the same people who express support for trade now could switch sides if tariffs were imposed on imports by a politician or party that they supported. This figure shows the range of opinions from "very strong opposition" to "very strong support" on a range of issues. 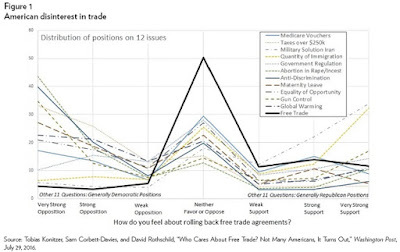 The black line shows that a much larger share of the opinions about trade are in the "neither favor or oppose" category than is true for the other issues. "Generally speaking, do you think U.S. trade policy should have more restrictions on imported foreign goods to protect American jobs, or have fewer restrictions to enable American consumers to have the most choices and the lowest prices?" "Are you willing to pay a little more for merchandise that is made in the U.S., or do you prefer the lowest possible price?" "[P]rotectionist policies emanating from the United States government today are most likely a response not to a groundswell of popular support for protectionism but instead to discrete interest group lobbying (e.g., the U.S. steel industry) or influential segments of the U.S. voting population (e.g., steelworkers in Pennsylvania). Protectionism therefore remains a classic public-choice example of how concentrated benefits and diffuse costs can push self-interested politicians into adopting polices that are actually opposed by most of the electorate." It's interesting that President Trump has a number of times defended his protectionist policies as a necessary negotiating step to greater free trade. From a trade policy perspective, this justification is the tribute that vice pays to virtue.